Famous Indian Bengali writer, novelist Samaresh Basu. Whose writings enrich to Bengali prose literature, can be said to be ripe Samaresh Bose is one of the top-rated talented writer of those. He is the father of many novels of varied tastes. In his writings, we get the wise description of political activities, life of working people, and various experiences of jounota. This author wrote many novels under the pseudonym- Kalkut and Bhramar. Kalkut means acute poison and he has written many novels in this name as 'Amrita Kumbher Sandhane', 'Swambo', 'Kotha Pabo Tare' etc. Samaresh Basu wrote 200 short stories and 100 novels in his name and with the pseudonym. His published stories and novels: 'Uttaranga', 'Daho', 'Ganga', 'Bibar', 'Prajapati', 'Muktobenir Ujane', 'Nayanpurer Mati', 'Shwambo', 'Chhaya Dhaka Mon', 'Srimati Kafe', 'Gogol Omnibus', 'Am Mahato', 'Ke Nebe More', 'Manomukur' etc. 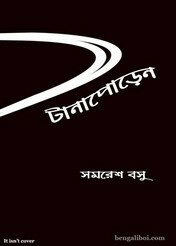 Now I want to share a remarkable book of his writing- 'Tana-Poren' in pdf file.